His words come after the liberal mayor of Warsaw tried to block the celebration this week, saying she feared violence and racist, xenophobic banners amongst the 60,000 or more that are supposed to show up. The court sided with Mr. Winnicki however, and the march will go ahead (see our related coverage). Because of the international commotion, organizers expect an even greater number of participants this year. Related coverage: <a href="http://thegoldwater.com/news/41707-Poland-Court-Overturns-Warsaw-Mayor-Ban-60-000-Nationalists-Set-To-March"> Poland - Court Overturns Warsaw Mayor Ban, 60,000 Nationalists Set To March</a>. Meanwhile, Warsaw itself prepares for the possibility that things could indeed get out of hand. Several foreign embassies, having seen the images of last year, issued security alerts warning their nationals to avoid crowds tomorrow. The US also sent one out. 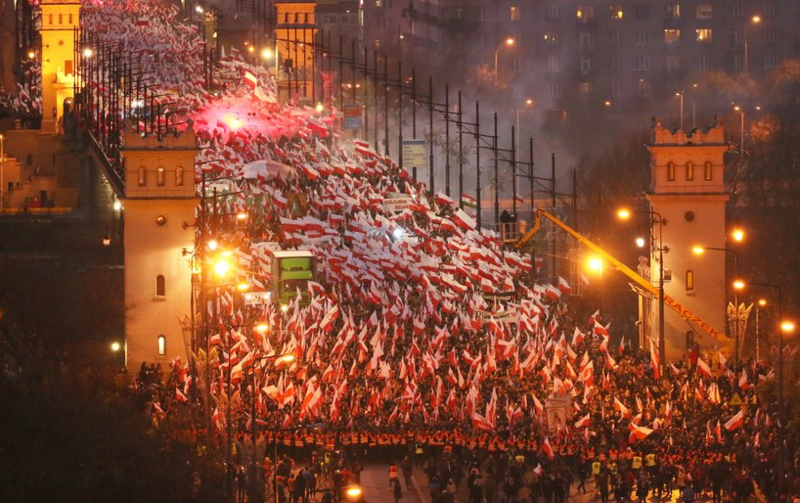 And the Poles themselves are also holding their breath, trapped between concerns that the march could provoke more discord and a faint hope that the state’s takeover could finally break the far-right’s hold over the Independence Day schedule. Meanwhile, foreign far-right groups are arriving in the city in great numbers. Wonderful!! Poland is showing the rest of the Western World what it means to say enough is enough of the barbaric islamic muslim invasions… When is the Protest March on D.C. telling them we have had enough by We the People scheduled? Good for them!!! Stand up for yourselves!!! I would love to move to Poland or Hungary. Unfortunately, the USSA is on it's way to becoming a third world hell hole. It seems the majority want illegals flooding the border and full-blown socialism/communism. The controllers want gun control so citizens are defenceless against the violent illegals. I'm glad I don't have children and am a little more than half way through my life. Looking around you have to come to the conclusion that the majority of people, not all but most, are really useless eaters. They vote against their own self interest and focus more on Transgender rights that creating healthier and wealthier communities for all humans.